What Is Albino Weed, And Does It Really Exist? Albino weed is a rare but not unheard of phenomenon. Here are a couple potential different causes, and why a little pigment in your buds can go a long way. Many may find it surprising that every once in a while, an albino plant is born. Albinism in plants is a rare but not unheard of phenomenon, and there are a couple potential different causes. 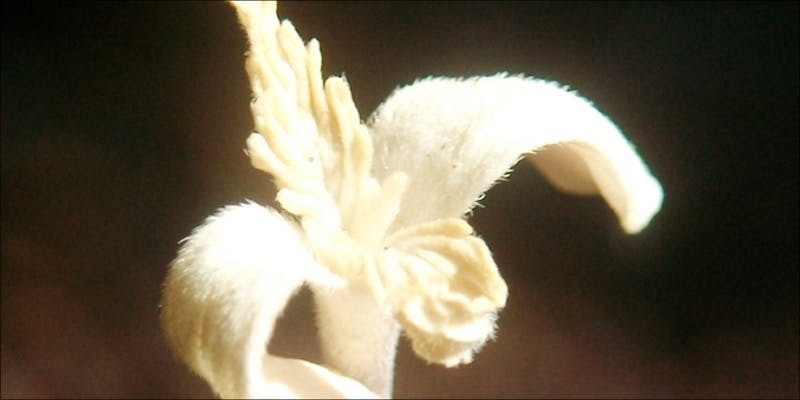 However, there are different theories and reasons why some plants express albinoism. 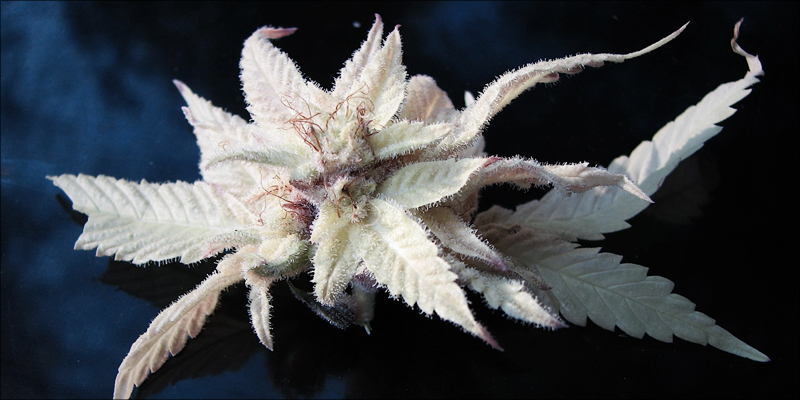 Here’s the scoop on albino weed, and whether or not it exists. Albinism in plants is an especially odd event. As many already know, plants produce energy from sunlight. The green color in leaves and other parts of the plant comes from a special pigment called chlorophyll. But, chlorophyll does a lot more than provide coloration for the plant. This pigment is vital for the plant’s survival. Chlorophyll absorbs the specific wavelengths of light that it needs (ultraviolet blue and red), and the what it doesn’t absorb bounces off, causing us to see a green color when looking at a plant in sunlight or another white light. When the chlorophyll absorbs the right types of light, it converts light energy into usable sugar via the process of photosynthesis. Albino plants do not have chlorophyll. That means that there is no pigment available to absorb energy from the sun. Basically, these plants have lost their ability to respond appropriately to light, sort of like they are constantly in the dark. This is why most albino plants die at an early stage before they’ve reached maturity. Like in humans, albinism in plants is a rare genetic anomaly. Albinism is a recessive genetic trait that makes plants weaker. Plants can show signs of albinism at the seedling stage. The plant doesn’t have to be completely white to be considered albino. Some plants may only lose chlorophyll on certain leaves or plant parts, which may be triggered by a combination of genetic and environmental factors. Interestingly, some species of albino plants are able to survive on their own. The albino coast redwood tree, found in Northern California, for example, does not photosynthesize at all. Rather, baffling botanists, the albino redwood has taken on a parasitic persona. The albino redwood taps into the roots of a parent tree, feeding off of its nutrients. While the albino redwood can survive in this way, it is significantly smaller, less robust, and features different needle characteristics than it’s healthier relative. Research into other albino plants may shed some light onto the possible ways to help albino cannabis plants survive, if only out of curiosity. The process of hybridization can also bring out albino traits in a strain. To hybridize a plant, breeders often backcross strains to bring out certain recessive traits. In some cases, it’s possible that hybridization may enable albino characteristics to express more often. Light bleaching is another major cause of whitening. Perhaps some strains have more of a genetic predisposition for turning white under certain lighting circumstances, but more research is needed to determine how albinism occurs in cannabis plants. However, it’s often the case that plants turn white in areas that are closest to the lights. Every once in a while, the top buds and leaves of a plant will bleach with the light intensity is too strong. This is a major source of stress for the plant, as the whitened bud then loses the ability to photosynthesize. Is white cannabis a good thing? As you may have guessed, the answer to this question is a simple “no”. White cannabis cannot harness the energy from the sun in the way that a green (or purple or red) cannabis plant can. Light bounces off of white objects, which is why grow room walls are often painted a flat white or covered in Panda Paper. Coloration in leaves and buds helps the plant take in sunlight and convert it to energy. Without the chlorophyll needed to convert light into sugars, the plant cannot survive. While providing supplemental nutrients may help, the overall quality of the crop will suffer. What do I do if my cannabis plant turns white? Whether it’s because of a lighting mistake or an unexpected breeding problem, there may be a couple ways to salvage a plant that has started to show white coloration. Very early research found that feeding plants sugars in the absence of light will help them grow and increase in volume. However, plant growth may be abnormal and the gains slight. Experiments completed as early as 1919 found that adding supplemental sugars and nutrients to albino corn samples did help them grow and increased the overall weight of the seed. Yet, without these supplemental sugars, the albino plants died. Should a cannabis plant begin to turn white or show signs of albinism, supplemental feedings may help save your crop from being a total bust if some green coloration is still present. Lighting adjustments are certainly another recommended option. Perhaps consider switching to a LED grow light with a lower wattage. Adjusting the height of the light may also be beneficial. Lights should be close enough to provide adequate lumens to the entire canopy, but not close enough to cause plants to show signs of heat stress. If a plant is white from a seedling stage, it’s probably one to toss. Some suggest that white cannabis plants will produce less THC and CBD than a green plant. This is a fair guess, as a white plant will have less of an ability to create the energy it needs to produce cannabinoids.